SI Civil/RSI/Dy Jailor/Fire Officers Men/Women Preliminary test Results/SI Civil/RSI/Dy Jailor/Fire Officers Men/Women Preliminary test Notification Rc. No.216/R&T/ Rect .1 / 2018, Dtd: 01.11.2018 Exam Date: 16.12.2018 Results Download. 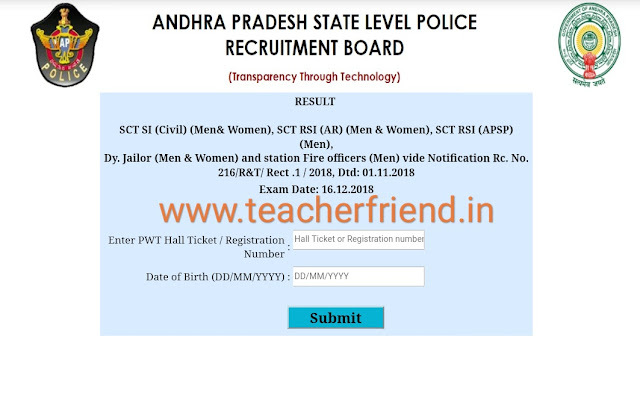 The final selection of the candidates (Men & Women) will be made strictly on relative merit, as obtained by them based on their score in the final written examination for 200 marks for the candidates who qualified in Physical Efficiency Test and as per the provisions of "The Andhra Pradesh Public Employment (Organization of Local Cadres and Regulation of Direct Recruitment) Order, 1975" and G.O. (P). No. 763, General Administration (SPF.A) Dept, dated 15-11-1975 as amended from time to time." As per G.O. Ms. No. 8 General Administration (SPF.A) Dept., dated 08-01-2002 while filling up the vacancies, the first 20% of posts should be filled following combined merit list of locals and non-locals and thereafter, the remaining 80% of the posts shall be filled up by locals only. The final selection of the candidates (Men & Women) will be made strictly on relative merit, as per marks obtained by them based on their score in the final written examination (for 100 marks) and Physical Efficiency Test (for 100 marks) totalling to 200 marks and as per the provisions of "The Andhra Pradesh Public Employment (Organization of Local Cadres and Regulation of Direct Recruitment) Order, 1975" and G.O. (P). No. 763, General Administration (SPF.A) Dept, dated 15-11-1975 as amended from time to time. As per G.O. Ms. No. 8 General Administration (SPF.A) Dept, dated 08-01-2002 while filling up the vacancies, the first 20% of posts should be filled following combined merit list of locals and non-locals and thereafter, the remaining 80% of the posts shall be filled up by locals only. The final selection will be strictly on relative merit of the candidates in each category, as obtained by them based on their score out of a maximum of 200 marks in Final written examination (200 marks). 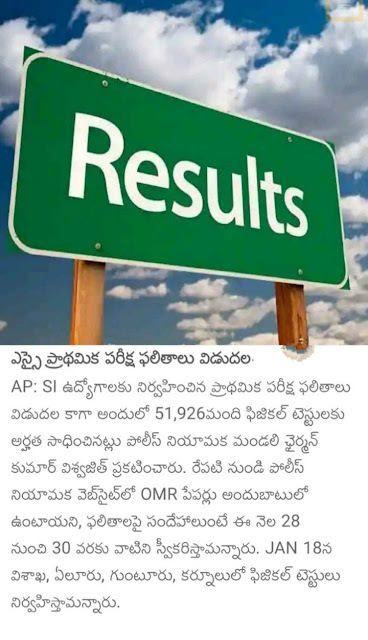 As per the provisions of "The Andhra Pradesh Public Employment (Organisation of Local cadres and regulation of direct recruitment) Order, 1975", the rule of reservation to local candidates is not applicable. Preference: When two or more candidates in a particular category obtain equal marks, preference will be given to the candidate who was born earlier.